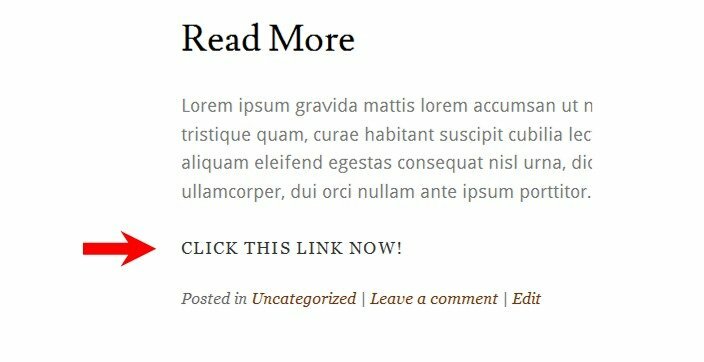 Below we’ve collected some “read more” plugins to help you gain more control over your excerpts, the links that go with them, and in some cases, even their corresponding full posts as well. With this plugin, when you click the “Continue Reading” link, the content will load right there on your homepage. If you click it again, the content will be hidden again. Your content still exists on its single page, of course. This just makes navigating your homepage more rewarding. You get the benefit of excerpts (scanning multiple posts and more content above the fold) and the benefit of showing your full posts all in the same place. To use this plugin, just click your “More” button as you normally would, and the plugin takes care of the rest. And then here’s the result. The AJAX Read More plugin is very similar to the plugin above, with a few minor differences. With this plugin, the “Continue Reading” link disappears once the rest of the content is loaded. Some may prefer that for a cleaner look; however, that also means that the user can’t hide the content again by clicking the link. This plugin lets you show excerpts on your homepage without touching any code. We have actually talked about this excerpt plugin before. So you can see some of the settings in that post. In any case, here’s a quick rundown of what this plugin will let you do. This plugin automatically cuts off post after the first image and first paragraph. If you don’t have an image at the beginning of the post, it will cut the post off after the first paragraph. In order to install this plugin, you will need to dig into your code a little. While the plugin above requires no digging into code, it will only show the text excerpt. This plugin allows an image to show as well. When you follow the “Continue Reading” link in WordPress, by default it not only takes you to the full post, but it also jumps you down to the spot where the original “Continue Reading” link was placed so that you can continue on where you left off. Some people find this disorienting. Enter the StripTease plugin. It makes it so you go to the beginning of the post. This plugin, quite simply, does exactly what you’d expect – it puts a no-follow tag on your “Continue Reading” link for SEO purposes. Google would say that this doesn’t matter, that all links on a page leak PageRank, be they follow or no-follow. Some SEOs, however, put a mirror up to everything Google says in public. You do this by simply adding whatever words you’d like to the “more tag” in the HTML view of your editor.